VOLCANO DREAMS – Coming Soon! Posted June 26, 2018 & filed under Book News, VOLCANO DREAMS. 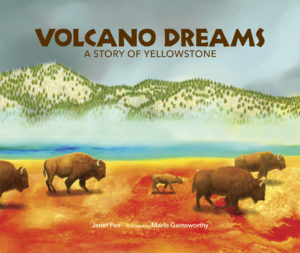 VOLCANO DREAMS: A STORY OF YELLOWSTONE (Web of Life Books) is my newest book, a picture book for readers ages 5-8 (and older!) out in September 2018. It tells the story of the Yellowstone super volcano, which is responsible for the thermal features that make Yellowstone one of the world’s jewels. The story of the volcano, right down to the magma chamber underground, is framed by the animals that inhabit the Park, from buffalo to elk to bears. Packed with facts about both animals and geology, VOLCANO DREAMS is beautifully illustrated by Marlo Garnsworthy. Starting next week, follow this blog for a tour of Yellowstone and a discussion about both the animals and the super volcano. Plus………….I’ll be running some cool giveaways. Stay tuned! Congratulations on your upcoming picture book release, Janet! I’d love for you to come on my blog and talk about your book in August or September when your book releases.